I hate the word diet. It makes me think of something you start and stop repeatedly. And, while I want to show you how starting a keto diet is helpful for weight loss, I also want to convey that this is something you should try to do long term. Keto is a term that means many things for many different people, but the gist is that it's a low carb, moderate protein, and high-fat diet. If you ask someone what keto is to them, you will likely be told about “nutritional keto” where you limit your carbs to 20-30g net carbs per day. And, a lot of people adhere to that, but I've found there's quite a good amount of people that are a bit relaxed in their carb consumption. So, How Do I Start a Keto Diet? Ok, ok. 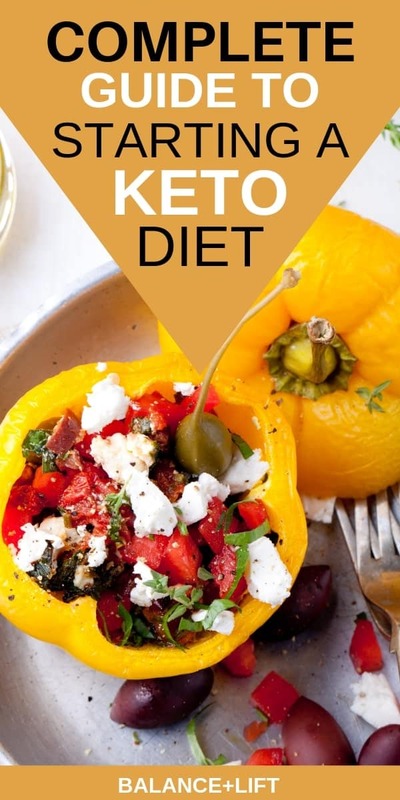 So, you've heard about this new diet trend that people are raving about — The Ketogenic Diet. It seems like another round of that crazy Atkins diet, am I right? But, the keto diet actually has some really awesome benefits that not everyone knows about. People tend to find the keto diet in their quest of wanting to lose weight. But, there are a lot of others that want to start keto because there are issues going on in their body that they aren't sure how else to fix. I watched a documentary in October 2017 on Netflix called “The Magic Pill” and it was pretty damn good! There was a woman who has beaten and breast cancer by adopting a keto diet. I was floored by that alone. I have a family history of breast cancer so it hit home a little bit for me. My grandfather has also told me about people his sister knows that had cancer and were using the keto diet to combat and battle against cancer and it was working. Initially, the keto diet was something prescribed for children and people who had epilepsy (1). By decreasing their carb intake it helped to limit or eliminate their seizures or epileptic symptoms. There was a little girl in the documentary (The Magic Pill) that is autistic and has epilepsy and watching her journey adopting a keto diet was so amazing. It made me extremely happy to see how she blossomed on the diet. The keto diet is essentially where you are eating about 75% Fat, 15-20% Protein, and 5-10% Carbs. By decreasing the number of carbs you intake, your body goes from using glucose as a fuel source to one where the body is using your own fat (or ketones) as a fuel source. Ketones are what is produced by your body when it uses fat as the fuel. Essentially, instead of your body turning carbohydrates into glucose for fuel, your body is turning fat into ketones. This allows your body to start turning to the excess fat stored in your body for fuel rather than seeking more fuel from the foods you eat. Decreasing the number of carbs you eat and increasing the fat you eat produces ketones in your body putting you into what's called a state of ketosis. This is where your body is efficiently using fat for fuel rather than carbs. It is what people are aiming for when they eat a ketogenic diet. With that said, not everyone eats a strict keto diet. The ratios I mentioned above are for the Nutritional Keto Diet. It's one of the most strict forms of keto. Not everyone will thrive on that version of keto though. Some people do better with a little more carbs. A lot of people come to keto for weight loss, but it can also help with things like sleeplessness at night, controlling hunger cravings, helping with mood swings, emotional health, and even reproductive health. Leanne Vogel from Healthful Pursuit really dives into the reproductive health aspect and things women encounter throughout their lives. I really love her philosophy and it's where I find myself drawn to the most. She comes at keto from the standpoint that not every woman needs to eat a strict keto diet, and even says that some women need more carbs than is typically “allowed” on keto. I use the Easy Macro Calculator on the site here to help me when I'm not sure what my macros should be. Once you know what your targets are I would suggest using a food tracking app like Cronometer.com or MyFitnessPal to track what you're eating. You don't know if you're hitting your targets if you're not tracking. Now, with that said, once you're a month or so into eating keto you can back down on the tracking and kind of eyeball things. You'll start to remember what foods have what kind of carb content and you can plan based on your knowledge. You have your macros now, but what does the keto diet do for me? When you start a keto diet and your body goes from using carbs to ketones for fuel your body goes into what's called a state of ketosis. This is where the body is using the ketones you're making to fuel and energize itself. When you're effectively using ketones your body becomes a fat burning machine. You can get into ketosis by lowering your carb threshold to below 50 grams of carbs a day, but to really reap the benefits of keto it should be closer to 30g and lower. If you're just starting out, you should keep your carbs to a maximum of 5% of your diet. On a 2000 calorie diet that would be 25g of carbs total (not net). Some people would argue and say you shouldn't go above 20g of carbs daily. But, the general rule is 75% fat, 15% protein, and 5% carbs. If you follow that you should be set. The easiest way to know if you're in ketosis is by using a blood ketone monitor like Keto Mojo's monitor (I have this particular one). You would use this device to test your blood ketone levels. Using a blood ketone monitor is the most effective way to know if you're in ketosis. If you aren't ready to dish out the money on a ketone monitor (I admit it can be pricey) then you can use some ketone strips instead. They're not as reliable because you may not always pee out the ketones. Some people have tested with both the strips and the monitor and found the monitor picked up the ketones whereas the strips didn't. That's not to say they're not handy, but they can be a bit inaccurate. That's why I opted for the monitor instead. The fastest way to get into a state of ketosis is by cutting out your carbs to stay at or below 20g net carbs. Especially in the first week. Once you've adapted to the diet you can play around and figure out what is best for you and your body carb wise. But, in the beginning, keeping your carb levels really low is important. You can get into ketosis in 24-72 hours this way. You won't be completely fat adapted, but your body will be in ketosis and running on ketones. If you find that you're hungry an hour or so after you eat this means that you need to up your fat content a little bit. Don't limit your grams fat too much in the beginning. You want your body to have enough to use to get into ketosis. Once your body is used to using fat as it's fuel source you can start to cut back a little bit each day to find your sweet spot. Your sweet spot will be where you're losing weight but you aren't ravenous. Some people pick and choose their feelings about the keto diet. But, it's been proven to be severely beneficial when done correctly. These side-effects are things you may or may not encounter when you're eating keto, but it's always good to know. When you swap out carbs for fats your body will retaliate. Your going to be flushing the fat cells of your body and releasing the toxins that are stored in the fat cells. This can cause what is known as the keto flu to happen. Your body will also be swapping from carbs as a fuel source to fat as a fuel source, this can cause you to feel pretty crummy as your body figures it out. Don't worry though the keto flu generally only lasts about 3-4 days. If you find it's lasting any longer than you might need to eat more salt, drink more water and take electrolytes. Beat the keto flu by following this post. You might experience a little dizziness in the beginning, but it will pass quickly. Make sure you're getting enough salt (you'll need extra) and electrolytes. When you go keto your body isn't retaining water anymore from the carbs, so you're going to be losing the water you're putting in your body. If you don't replenish the water, salt and electrolytes you're losing it will spell disaster. Your body is going to be working on overtime when you first make this transition. You're not getting the carb fuel your body is used to having so your energy might wane a little bit. Once your body figures out that ketones are an excellent source of fuel and energy you should snap back with a quickness. The easiest way for your body to figure this out (without waiting 3-7 days) is by taking a supplement like Perfect Keto's Exogenous Ketone Base. This has ketones in it and when you take it, it's like a little hint to your body that it should use the ketones you're now producing. Don't worry… this will pass once you get your body used to the amount of fat you're eating. If you're eating too much cheese, though, you can cause yourself to be a bit on the constipated side. So, increase your oily fat content to help balance that out. But, if you're on the runny side you might want to cut back on the number of oily fats you're eating. Try adding a bit of cheese or maybe some extra green veggies to help balance you out a bit. Your body will adjust and this will go away. Sadly, this is a thing, but only if you bounce from keto to not keto and back again. It's the same reason the Atkins diet was so hated. The best way to avoid this is 1) make a commitment to this lifestyle and dietary change or 2) decide if you're able to make the change. Not everyone is willing, and that's ok. If you ease into keto and decide it's not for you, then you can also ease out. You'll put back on the water weight you lost at the beginning of keto as you start eating more carbs. But, if you go on to eat a healthy diet you can still lose weight. With a lack of energy and feeling fatigued it would be natural to see a downslope in your athletic performance too. Just be patient with your body as it makes its adjustment. If you absolutely don't want to wait while your body adjusts then I would take this pre-workout by Perfect Keto. It won't spike your blood sugar levels and keep your body moving towards ketosis. Honestly, I've only read about this in instances where people are eating meat and cheese only for their diet. When you're not eating a well-rounded diet, in ANY case, it will lead you down a path of destruction. Don't eat crap and you won't feel like crap. You want to include low carb vegetables in your diet along with moderate protein and good sources of fat. See how to avoid these keto diet risks here. The best way that I've found to get started is just to get really serious with yourself and why you're wanting to make this change. And planning is super key here too. Believe me. If you don't plan, and you aren't prepared you will slip up. Ask me how I know;)? Why are you wanting to start a ketogenic diet? Is it to lose weight? To have more energy? To regulate your hormones and the menstrual cycle? Or to feel better? Write it down and keep it where you can reference it later. This is really important. I've found that if I don't make a meal plan then I get kind of overwhelmed thinking about what I want to eat for which meal. So, we've started making a meal plan to follow. But, I'm not strict with it. If we want to shift meals around during the week so long as we don't deter from the meals on the meal plan. This helps to also keep down on grocery costs too. We're trying to keep our grocery budget low, so sticking to our plan is really important. When you first start shopping for your new keto lifestyle it will be tempting to buy things you're craving. Keep your list on hand when you're shopping and try to stick to what's on your list and nothing more. The fewer distractions you have on hand at home the better. You won't end up caving to an evening snack unless it's a keto-friendly snack. Also, there are many ways to make your favorite foods keto! Be sure to search Pinterest for how to make your favorite keto foods. Snacks are amazing things when you're first starting a keto diet. Here are 5 best keto snacks to keep on hand if you need some ideas I recommend checking that post out. It's not all-inclusive but it will give you somewhere to start and you can figure out your favorites from there. But, don't just make a commitment to starting this diet. Make a commitment to yourself. Remember why you're doing this. For me, it's about healing my body and my hormonal imbalance so that I can lose the weight that's been holding on for dear life to my body. If you're ready to make serious changes and are tired of nothing working then buckle up and hold on for the ride. The first few days can be super rough, but you can make it. I'll be sharing how to beat the “keto flu” in my next post so be sure to stay tuned and to figure out just what keto flu is! 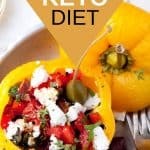 Don't forget to check out What to Eat on the Keto Diet!